On Friday 29 June, the London 2012 Olympic Torch Relay – presented by Coca-Cola, Lloyds TSB and Samsung – will travel 112.40 miles through 12 communities on its journey from Nottingham to Derby. The Relay will travel through the following communities: Nottingham, Newstead, Glapwell, Bolsover, Calow, Chesterfield, Matlock, Darley Dale, Bakewell, Buxton, Ashbourne, Derby. 8.14am – Nottingham Castle. The first Torchbearer of the day is Barbara Green, 58, from the Clifton Estate, Nottingham. Barbara will carry the flame through the grounds of Nottingham Castle to the Robin Hood Statue. Barbara was nominated by Nottingham City Council though the LOCOG campaign. She has volunteered in the local community for many years helping young people, particularly those with special educational needs. 10.33am – Newstead Abbey. The flame will be carried through the grounds of Newstead Abbey by Samuel Van de Schootbrugge, 19, from Nottingham. Samuel was nominated by Lloyds TSB as an Olympic hopeful. Samuel, who held a 200m individual swimming medley record, was selected because of his commitment and dedication to his sport of swimming and inspiring his peers through coaching and giving presentations to younger swimmers in his community. Samuel is an athlete on the Lloyds TSB Local Heroes programme. 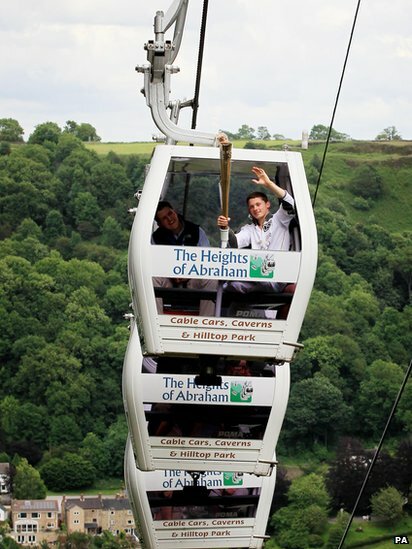 2.20pm - The Flame will be carried on the Heights of Abraham Cable Car by Dominick Cunningham. Dominick, a last minute replacement to Team GB for the 2011 European Youth Olympic Games, got off to a fantastic start by taking the Gymnastics Team silver with teammates Frank Baines and Courtney Tulloch with a combined to score 164.950 just behind Russia with 165.400 and ahead of Switzerland – 163.700. At Youth Commonwealth Games later that summer Cunningham was the most successful gymnast in Games winning three Golds, one Silver and a Bronze. 3.37pm - Chatsworth House, Bakewell. The Torch will be carried through the grounds of Chatsworth House by Ben Hope, 17, of Buxton. Buxton Park Bowling Club nominated Ben through Samsung’s campaign, in recognition of his fund-raising efforts. He cycled 150 miles across England in 2009, raising £1,500 to support the work of two local neonatal Intensive care Units and a neonatal transport team who were involved with the life-saving care of his three year old sister, when she was born three months premature. In 2010 he cycled 250 miles across Scotland, raising £350 towards the refurbishment of the Bowling Club. This year, he and two of his friends, have cycled across England, again, raising £1,000 for Help For Heroes. Ben will hand the Flame in front of Chatsworth House to Helen Hopkinson, 33, from Nottingham who was nominated through the LOCOG campaign. Helen gives her time to a number of cancer charities and in 2010 she was signed up as a Cancer Campaigns Ambassador for Cancer Research UK. Towards the end of 2010 Helen met with her MP to discuss the importance of early detection of cancer and asked that he speak to the Secretary of State for Health on the issue. Following this campaign (involving over 70 Ambassadors) extra funding was secured for early diagnosis as well as a commitment to record diagnosis data more consistently. 7.20pm – Darley Abbey Park, Derby, Evening Celebration. The final Torchbearer of the day will be James Toseland, 31. James, who is Donington Park’s official ambassador for the 2012 race and track day season, was the youngest ever World Superbike Champion at 23. He is two times World Superbike Champion and retired from racing in 2011 due to injury. He is one of Britain’s most successful motorcycle racers. The evening celebration will take place in Darley Abbey Park will feature a variety of entertainment staged by LOCOG and the three Presenting Partners of the London 2012 Olympic Torch Relay - Coca-Cola, Lloyds TSB and Samsung - with support from Derby City Council. The evening will begin at 5.30pm and finish by 8pm. The line-up includes music from Loick Essien, a dance troupe who will provide a unique fusion of street performance, theatre and sport and dance act Twist and Pulse. Towards the end of the show the final torchbearer of the day, James Toseland, will light a celebration cauldron on stage at the event which will enable the Olympic Flame to be seen by the audience. Barbara Green, 58, from Nottingham and carrying the Flame in Nottingham. Born in Nottingham, Barbara, who was nominated by Nottingham City Council through the LOCOG campaign, has lived on the Clifton Estate since 1961 and has always been involved in her local community. When her boys were younger, Barbara became a parent volunteer at Swansdown Infants followed by Milford Junior School. Barbara also ran a Girls Brigade Company at the local Methodist Church for many years and was the secretary for the Clifton Carnival Committee as well as helping to set up the Clifton Comets Motorcycle Club. Having volunteered for 6 years at Brinkhill Primary she moved to Farnborough Secondary School she was offered the support teacher role that she currently holds. She commenced running a Duke of Edinburgh project at the school in her own time, providing additional sessions for young people with special educational needs. Kaylet Smedley, 80, will carry the flame in Bolsover. Kaylet was selected through the LOCOG public nomination campaign. She has been the chairperson of the Derbyshire branch of the Leukaemia and Lymphoma Research Fund since 1968. Kaylet started the branch following the death of her son Andrew, who was eight years old, from Leukaemia. Under Kaylet`s leadership the Derbyshire branch has raised over £1 million for Leukaemia and Lymphoma research. Despite advancing years she remains a vigorous organiser and an inspiration to her team of volunteers. David Raizada, 60, from Chesterfield, will carry the flame in Bolsover. David was nominated through the Lloyds TSB public nomination campaign. He set up and runs The Youth of Barlborough Club (YOB). In the six years since the project’s inception almost 500 different young people in the age range 8 to 16 have attended. David is also chair of the local Sports Action Group which promotes all age sports participation across the community. Katy Wilson, 16, from Nottingham, will carry the Flame in Calow. Nominated through the Samsung campaign for not letting her Cystic Fibrosis stop her playing tennis every day. She has represented Derbyshire, reaching number on in the county for Under 16s. Her aim is to become a tennis coach and she already helps train younger players at her club. She never complains about her condition or expects special treatment – many of the other players don’t even realise that she has Cystic Fibrosis. Joel Knight, 16, is carrying the Flame in Chesterfield. Teenage swimming sensation Joel Knight set a new personal best in claiming the 1500m freestyle title in Turkey at the 2011 European Youth Olympic Festival, nearly ten seconds ahead of his nearest challenger. Prior to the Festival, he came an incredible fourth in the 1500m freestyle at the British Swimming Championships in Manchester in March last year, behind race winner Olympic silver medallist David Davies. That swim made him the fastest 1500m swimmer for his age in British history. Donald Scott, 83, from Derby is an inspirational Boxing Olympian having competed in the 1948 Olympic Games which was the first Games after World War II, with very little support or resource to do so. Donald who is carrying the Flame in Derby won the silver medal at Light Heavyweight. He subsequently won the Empire Games gold medal in Auckland. He served in the Royal Military Police during national service. He boxed professionally as a heavyweight and was managed by Bob Curley. He was a big enough name from his amateur career to box in London at the Albert Hall. He continued his interest in boxing in the Derby area and was involved in coaching. He regularly attended both amateur and professional boxing events in Derby and preferred to sit quietly at the back rather than be presented in the ring. Lloyds Banking Group is Britain’s biggest corporate investor in UK communities and in 2011 invested £85 million and as part of the Group’s Community Investment Programme, we’ve launched the Lloyds Banking Group Community Fund to give back to the communities in which we operate and pass through on our journey with the Olympic Flame. We’re inviting everyone to visit the Lloyds TSB stand at each Evening Celebration to vote for a community project in their area that inspires and supports young people. By voting at the Evening Celebration members of the public will automatically enter a draw to win four tickets to London 2012. The two projects that receive the most votes at each locality will each win a £5,000 grant from Lloyds Banking Group. At the Lloyds TSB site members of the public will also have the opportunity to have their photo taken with the Olympic Torch, meet Lloyds TSB Local Heroes – the future stars of Team GB and ParalympicsGB – and get up close to our Flame Followers. To find out how you can join in the celebrations with Lloyds TSB. The BBC will be providing extensive coverage of the Torch Relay on television, radio and online. This will include special Breakfast shows on every BBC local radio station, and extended live coverage of an evening celebration event in every Nation and English Region. Full details of the coverage will be at bbc.co.uk/2012.